← Welcome to Mine for Nine’s Blog! Whether your pregnancy was long-awaited or a total surprise, you’ll soon find yourself struggling to get ready in the morning as you try on all the clothes in your closet that no longer fit the same way they used to fit. 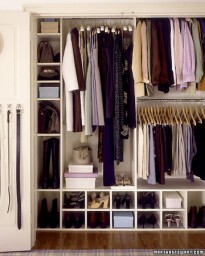 Save yourself a lot of time and stress by editing your closet ASAP in your first trimester. Now you should have a clear path to the clothes that fit you when you get ready in the morning and a clear idea of how many outfits you have to choose from. Disappointed in your selection? Now’s the best time to look for creative combinations of clothes & to pull out the accessories! A plain white top will look great if you pair it with a colorful scarf at the beginning of the week and a cute cardigan at the end of the week. If you really like to be prepared, make a list of the important events you have coming up in the next few months and what you’ll need to wear for each (weddings, business meetings, conference presentations, parties, etc.) so you can be on the lookout for the perfect outfits. You’ll probably have to revisit your closet edit as your belly grows in the next few months and the once stretchy waistbands start to pinch, but setting aside a little bit of time each month will save you a lot of frustration later! Reward your diligence by treating yourself to a new outfit from Mine for Nine after every closet purge and before each of your special events! 2 Responses to Empty Closet = Happy Mornings! Theres a terrfiic amount of knowledge in this article!